Twelve-year-old Manuel leaves his small town in Mexico to join his older brother in Los Angeles. To cross the US border, he must become a “beast rider” - someone who hops on a train. The first time he tries, he is stopped by the Mexican police, who arrest and beat him. When he tries again, he is attacked by a Mexican gang and left for dead. Just when Manuel is ready to turn back, he finds new hope. Villagers clothe and feed him, help him find work, and eventually boost him back onto the train. When he finally arrives in LA and is reunited with his brother, he is elated. But the longer he’s there, the more he realizes that something isn’t right. 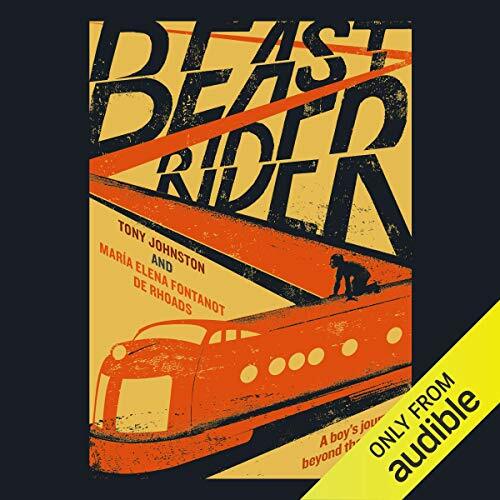 Thrilling and heartfelt, Beast Rider is a coming-of-age story that reveals how a place and its people help to define you. ©2019 The Johnston Family Trust and María Elena Fontanot de Rhoads (P)2019 Audible, Inc. I have many times asked, why would someone choose to take this dangerous journey. My grandparents were brought by there parents from Mexico when they were about 5 years old. My children's father came from Honduras. I'm grateful that my life hasn't been so painfully hard that I would have to leave my country.